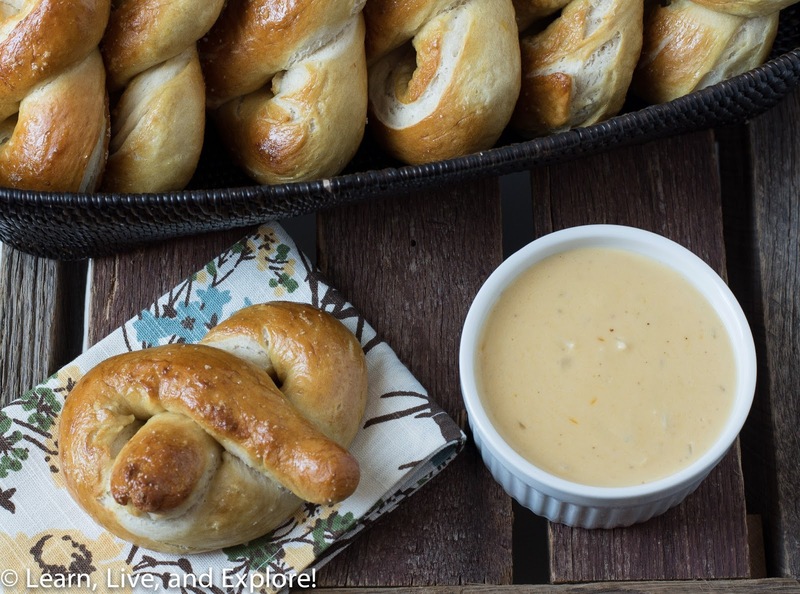 Homemade Soft Pretzels and Beer Cheese Sauce ~ Learn, Live, and Explore! Continuing on with the March/Irish theme this month, I had a short train of thought that led me to my next baking idea. Of course, March means St. Paddy's Day. Which means beer. And what goes perfectly with beer? Soft pretzels! So I decided to tackle the mild challenge of making homemade soft pretzels. Let me tell you, they are delicious! 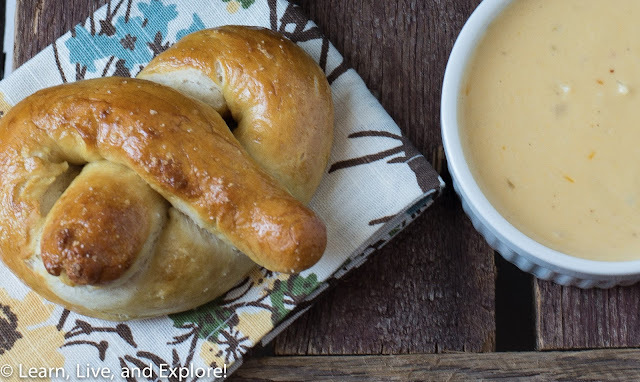 Paired with a beer cheese sauce, well what could be better? 1. Bring water up to a temperature between 100-115 degrees (no more or it will kill the yeast). Combine the water, sugar and kosher salt in the bowl of a stand mixer and sprinkle the yeast on top. Allow to sit for 5 minutes or until the mixture begins to foam. 2. Add the flour and butter and, using the dough hook attachment, mix on low speed until well combined. 3. Change to medium speed and knead until the dough is smooth and pulls away from the side of the bowl, approximately 4 to 5 minutes. 4. Remove the dough from the bowl, clean the bowl and then oil it well with vegetable oil. 7. Line 2 half-sheet pans with parchment paper and lightly brush with the vegetable oil. Set aside. 9. In the meantime, turn the dough out onto a slightly oiled work surface and divide into 8 equal pieces. 10. Roll out each piece of dough into a 24-inch rope. Make a U-shape with the rope, holding the ends of the rope, cross them over each other and press onto the bottom of the U in order to form the shape of a pretzel. Place onto the parchment-lined half sheet pan. 11. Place the pretzels into the boiling water, one at a time, for 30 seconds. Remove them from the water using a large flat spatula. 12. Return to the half sheet pan, brush the top of each pretzel with the beaten egg yolk and water mixture and sprinkle with the pretzel salt. 13. Bake until dark golden brown in color, approximately 12 to 14 minutes. 14. Transfer to a cooling rack for at least 5 minutes before serving. 2. Add the chopped onion and cook until the onions are soft and translucent, about 4-5 minutes. 3. Add a pinch of salt and the flour, stirring to coat the onions completely, and cook, stirring constantly for about 3-4 minutes. 4. Slowly add the beer to the roux, whisking constantly. 5. Next, slowly add the heavy cream, again, whisking constantly and breaking up any clumps of flour that may have formed. 6. Bring the mixture to a gently simmer, and add the cloves and nutmeg, and cook, whisking occasionally, for about 30 minutes. 7. Remove the sauce from the heat and slowly whisk in the grated cheese, adjusting the amount of cheese to your desired taste and thickness.